What exactly is Heaven Can Wait? 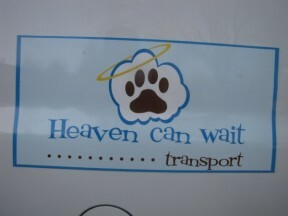 Heaven Can Wait is a transportation unit that takes dogs of any size that were going to be euthanized out of the Central Valley and drives them to Medford, Oregon to give them a second chance at life instead of death. 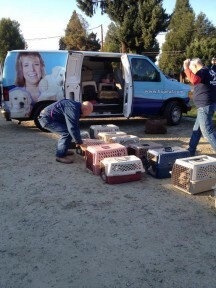 Linda Guthrie, President of Animal Rescue of Fresno (ARF), has been with ARF for 15 years and is one of the transporters. The passenger is whoever can go with her to help and experience the joy of watching when they arrive at the destination. It’s like kids getting candy for the first time. They look at each and every dog and are fully engaged in finding forever homes for these dogs. The first trip started in the year 2010, and left ARF with a van loaded with dogs that cheated death and were heading for Southern Oregon Humane Society, where they would have a chance at a forever home. We continue today doing trips roughly every two months. The trips have increased as the need to save increases. When we take the animals to the Southern Oregon Humane Society, some lucky dogs get adopted the very same day they arrive. Our last trip, which was in late September, we took 38 dogs and within the first three days of us transporting, there were 10 adoptions. The dogs start arriving at ARF within two weeks sometimes three weeks earlier to avoid being euthanized. We are truly blessed with the help of our amazing volunteers who mentioned to me they would rather work a little harder if it means that some dogs are alive and safe. We go to various shelters, telling them what we are doing and they get as excited as we do when we can save lives. We have taken dogs from Madera, Sanger, Selma, Hanford, Clovis and a few rescues as well. As you can imagine, it can become quite expensive to do these trips so we do fundraisers for Heaven Can Wait to help these trips keep going. No funds are ever taken from ARF to fund the trips. We ask the community to join us and help make donations to sponsor a dog for the trip if they cannot have a dog of their own. Our next trip is scheduled for December 10, 2013. You can donate to Heaven Can Wait by making a donation on on the ARF website and making a notation that it is for Heaven Can Wait. You can see comments by the Southern Oregon Humane Society about Heaven Can Wait on their blog. Mindi Miller became a volunteer with ARF eight years ago. Slowly she started to get more involved with fostering and then became the Volunteer coordinator and joined the board. She believes that volunteering at ARF has changed her life for the better, and prays that one day they will no longer need to do this.